I remember my first day at a new job in 1981. This is the job that launched me into a 32-year career in lubrication. My first assignment was to conduct a telephone survey of industry professionals on various topics related to oil analysis and contamination control. I quickly learned that the industry was suffering from stagnant practices and lethargic attitudes. It was not too long thereafter when I began to have second thoughts about the wisdom of pursuing lubrication as a career path. Perhaps some of you have had similar feelings. It took a while, but I eventually came to realize that what seemed like a dismal state in an old and generally unexciting field was actually a huge opportunity in disguise. It reminds me of the story of the two shoe salesmen. They were both sent by their factory to Africa to see if there was a market for their product. The first salesman quickly reported back: “This is a terrible business opportunity. No one wears shoes.” The second salesman reported back: “This is a fantastic business opportunity. No one wears shoes.” At first I saw the lubrication field like the first salesman. I soon came to realize the enormous potential that it actually represented. The lubricant Optimum Reference State (ORS) is a critical concept in the journey to world-class lubrication and enhanced machine reliability. In short, it is the prescribed state of machine configuration, operating conditions and maintenance activities required to achieve and sustain specific reliability objectives. Lubrication excellence is achieved when the current state of lubrication approaches that of the Optimum Reference State. Able to achieve the desired reliability objectives related to the financial benefit, safety and machine readiness. Now, 32 years later, I’ve compiled a list of “lessons learned” related to my experience in lubrication and oil analysis. Lurking within these lessons are many of the opportunities to which I am referring. While these themes may be viewed as old news and certainly not profound, they are fundamental concepts that are largely underdeveloped and, in my opinion, need to be understood as the foundation of any transformational strategy by users. Lubrication is heavily influenced by behavior science. Machines fail largely by human agency, i.e., things you do that you shouldn’t and things you don’t do that you should. Critical to this is behavior that is influenced by culture, reward, recognition and attitude. Lubricant-induced machine failure is highly controllable. The greatest amount of this control lies with the user organization. However, original equipment manufacturers (OEMs), lubricant suppliers, component suppliers and laboratories also have great influence on machine service life. See Figure 2 on page 4 relating to the attributes of the Optimum Reference State (ORS) and where there is the most “control,” as well as the sidebar (left) that defines the Optimum Reference State. Clean, dry and cool lubricants yield huge reliability returns (proactive maintenance). The majority of the case studies Machinery Lubrication has published relate to this basic strategy. Proactive maintenance monitors and eradicates root causes before serious harm is done. Few root causes are as important to control as particles, moisture and excessive heat. Lubricant starvation is a pervasive, yet largely unrecognized cause of premature machine failure. Moderate lubricant starvation is often difficult or impossible to detect. 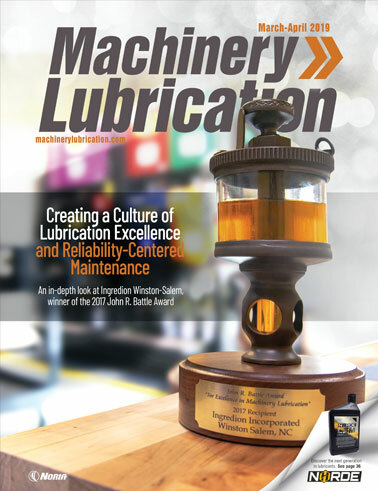 I recently wrote an article on this (see www.machinerylubrication.com/Read/29040/lubricant-starvation-dangers). Understandably, lubricant starvation impairs the basic functions of lubrication. Examine the subtle and countless ways starvation occurs. Skillful, daily one-minute inspections are very effective at early detection of many common lubrication problems. This sounds simple enough, but most routine inspections are horribly inadequate (e.g., limited to such things as oil level and leakage). Blatant opportunities to detect and correct problems are generally unexploited. Users typically only get about 10 percent of the available benefit from oil analysis. Most oil analysis programs have been whittled down to the bare minimum and are run by unskilled onsite personnel. Many critical improvements relating to the quality of sampling, frequency of sampling, quality of the test slate and interpretation methodology often remain untouched. Education enriches the maintenance culture and is a strong impetus to change and improve the lubrication program. As educators, we’ve been closely monitoring the progress of our clients in advancing their lubrication programs. It’s of little surprise that there is a correlation between the extent of program success and the level of education by personnel. Procedure-based maintenance strengthens the awareness and importance of correctly performed tasks. Lack of procedures conveys that doing tasks any which way is good enough. Documenting best practice in work procedures conveys the need to do the right things right the first time and every time. Machine criticality and other risk factors should be used to properly establish maintenance priorities and focus resources. Controlling every possible failure root cause for each machine in a plant is wasteful and generally overwhelming. Knowing both the probability and consequences of machine failure is a much better way to optimize a program transformation. Why are plants so slow in adopting and deploying optimum lubrication practices? This question has befuddled industry professionals for years. The basic attributes of the Optimum Reference State (ORS) are widely known and are certainly deployable. The benefits are also well-documented by countless case studies, and the risks and costs are relatively low. So why hasn’t the ORS reached a usage tipping point? Perceived usefulness - This is defined as “the degree to which a person believes that using a particular technology would enhance his or her job performance.” For instance, how do better contamination control practices influence the jobs of maintenance managers and their workers? Perceived ease of use - Davis defined this as “the degree to which a person believes that using a particular technology would be free from effort.” In lubrication, maintaining the status quo is easy, while implementing modernized lubrication practices can be viewed as difficult, expensive and disruptive (during the deployment period). The basic elements of the TAM are shown in Figure 1. This has many parallels to the challenges facing the lubrication industry. 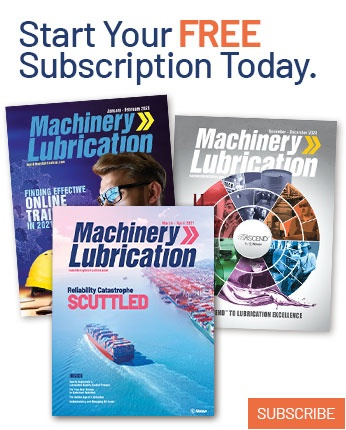 The very fact that adoption of optimum lubrication practices has been so delinquent makes the case that one or two of these elements have strained progress. Figure 1. This relational diagram illustrates the elements of the Technology Acceptance Model (TAM). Fundamentally, there is a need for users to believe that optimized lubrication: 1) is considerably different from the current state of lubrication in many critical areas, 2) will bring real value to users’ organizations and to maintenance workers individually (financially and career development), 3) can be deployed with manageable risk and cost, and 4) is sustainable. Innovators – These highly educated, leading-edge individuals are often viewed as risk takers. Early Adopters – This is a young, well-educated group of leaders (willing to champion innovative ideas). Early Majority – This group is conservative but open to continuous improvement. Late Majority – These individuals are older, less educated, fairly conservative and less influenced by social or technology trends. Laggards – This group is very conservative, oldest, least educated and slow to change. These groups form an adoption timeline as shown in Figure 3. In his book Crossing the Chasm, Geoffrey Moore makes a modification to the graph by adding what he calls “the chasm.” He states that progress along the timeline critically depends on crossing this chasm. The chasm is the point at which most new technologies fail to become mainstream in the market. Companies who introduce these new technologies can flounder due to their failure to reach the critical mass that enables the chasm to eventually be crossed. Figure 2. 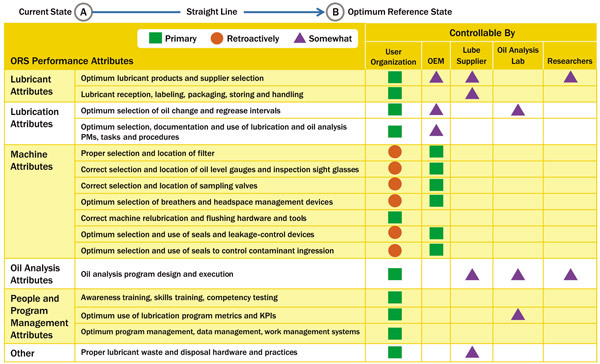 This table shows critical lubrication Optimum Reference State (ORS) attributes and responsibility in controlling these attributes. Note that retroactive responsibility relates to machine modifications after installation at the user’s site. The state of machine and plant reliability should not be maximized but instead optimized. In lubrication, and maintenance in general, the goal is precision, i.e., the precise lubricant, the precise amount of lubricant, the precise inspection method, the precise relubrication frequencies, etc. The Optimum Reliable Plant (ORP) is one that approaches the ORS in all areas that enable reliability, with lubrication being one of the most critical. Figure 3. The Technology Adoption Cycle was modified by Geoffrey Moore to include “the chasm,” where most new technologies fail to become mainstream in the market. Many of us, including Noria, are stakeholders in the lubrication industry, while others are users or vendors of products and services. Getting over the chasm in the adoption cycle is in everyone’s interest. There is no secret formula, just a lot of critically important work that must be done. Procrastination is perhaps the greatest risk. Some specialized skills and tools are needed. It’s best to find experienced professionals with expertise in the critical attributes of the Optimum Reference State. Sadly, old-timers may lead you in the wrong direction unless their skills have been refreshed from recent training. Strongly consider outsourcing as an option to avoid the need to hire or develop the internal resources required to cross the chasm. This could also avert the risk of losing focus from other routine and operational priorities. Service providers, such as Noria, can supply the needed expertise to facilitate (or turnkey) the transformation to the Optimum Reliable Plant. Among the services available include training, machine modification, procedure development, oil analysis program development, lubricant consolidation, lube room modernization and many others.